Hi everyone!!!!! Hope you are all doing well and that this holiday season is treating you all wonderfully! As much as I love this time of year I am in full finals swing so that usually means like myself my skin is also freaking out. 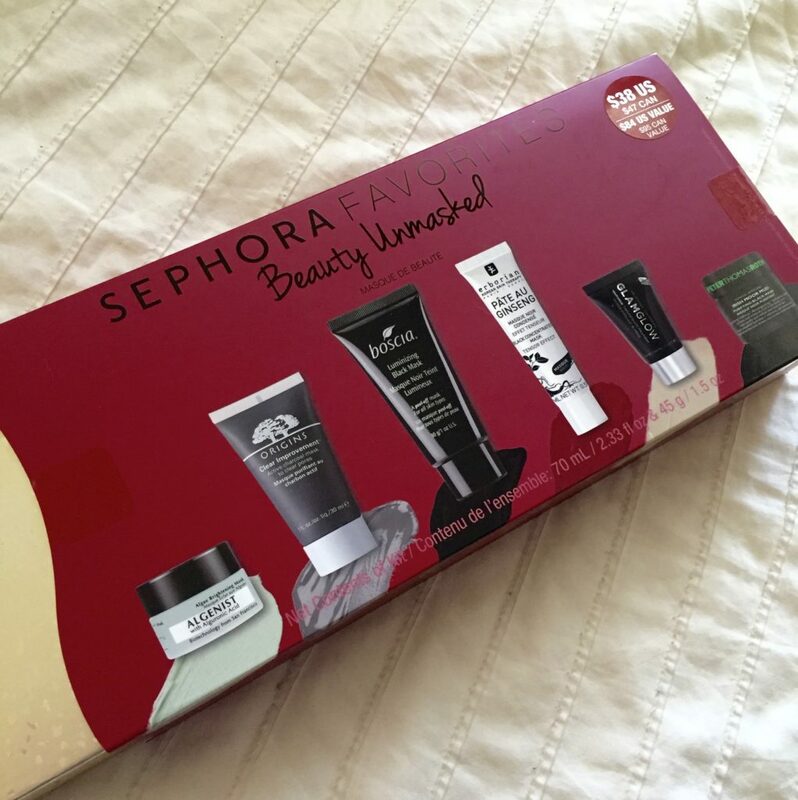 During my haul from sephora I picked up this sample pack of some of their most popular pore cleansing, anti-aging and radiance boosting masks. Because I live in an extremely humid climate I find that masks really help to give my skin that extra boost that it needs and clear out any built up dirt and gunk. So after the really taxing task of trying them all I wanted to report back and give my thoughts on each one! Hope you all enjoy!!! Peter Thomas Roth Irish Moor Mud– I LOVE this mask! Haha ok I think that was super direct and concise. I am already such a fan of Peter Thomas Roth masks with my all time favorite being the pumpkin enzyme one. If you like that one then this Irish Moor Mud will be very similar for you. It has that slight tingle right when you put it on and then when you wash it off it leaves your skin looking refreshed, degunked and glowing. Boscia Luminizing Black Mask– I have to say I am such a fan girl of this line and was a big fan of this one in particular before getting it in this pack. I have gone through three tubes of it already =/. I will say that when you initially put it on I have experienced watering of the eyes but that subsides. It dries like a fun latex and after 30 minutes you peel right off! The peeling is honestly so much fun. I like how clean this leaves my skin effective it is at removing first from my skin. Glamglow Youthmud– Hello who isn’t obsessed with this brand! I remember when I first stumbled upon Glamglow and you couldn’t order it from anywhere other then their website. This mask is like more other traditional clay mud mask out there except way cooler. You can actually see the mud trapping and extracting all the dirt from you skin all while it is pumping your skin full of ant-aging compounds. It doesn’t irritate you skin at all even though it has a tingling factor included. 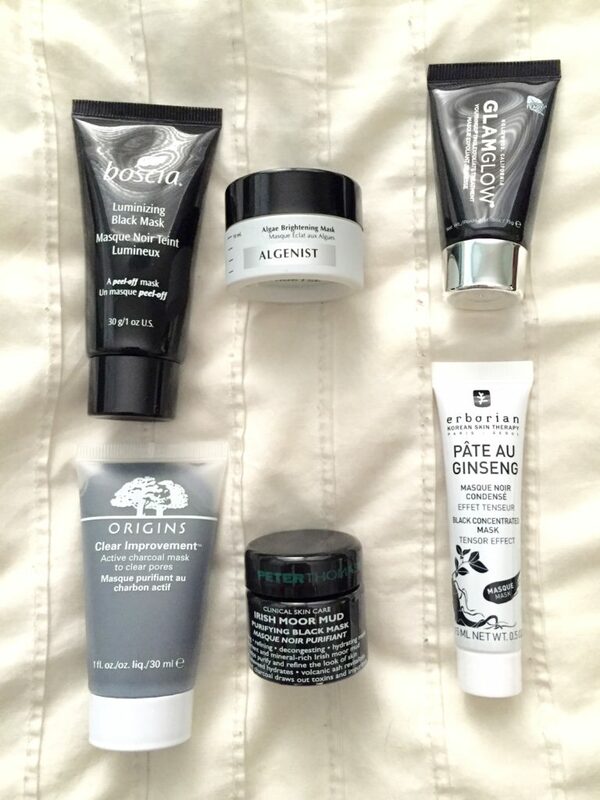 Origins Clear Improvement– I feel like Origins had the first charcoal mask ever. Ever since I have been using products from them I feel like this mask has always been there. The mask goes on great and there is no fuss to it which I really enjoy and I really find this one super effective. I don’t use it every week but this is always a constant staple in my routine. Erborian Pâte au Ginseng Black Concentrated Mask– You guys!!!! I am in love with this mask! This was one that I have never tried let alone never even heard of before getting it in the samples and my gosh it is wonderful! I woke up after doing it before bed and my skin was so incredibly soft! It is a gel like mask and smells a bit like roses to me when you apply it. Its very gentle yet I find it to be vert effective! I will most defiantly be purchasing after run out of my sample. Algenist Algae Brightening Mask-I had honestly never heard of this brand before. But I am all about the algae skin products so if it has Algae I am slapping it on this face hahaha! Really though, I just always read about all the benefits that it has for your skin so I am always so excited to find products that contain it. A little bit of this mask really does go a very long way, I was shocked! It stays on for 10 minutes and in the morning my skin looked glowy and clear. If you are like myself and have an oily complexion then this is right up your ally! It is very light and gentle I just know you will love it! All in all I would say this kit is a good one to invest in for yourself or a great gift for a skin obsesses friend/ family member. Hope you all enjoyed and that this helped you all a little Happy shopping loves!